Our Road Mesh® has been chosen to reinforce the asphalt of the D1 Budimir-Bidovce motorway in Slovakia. The designer found that our product was the most suitable solution to increase pavement service life and road safety, as it improves resistance to rutting and shoving. MACCAFERRI CENTRAL EUROPE provided a complete technical service, supporting the client both in the design phase and during installation. Road Mesh® is a planar grid material used for the structural reinforcement of asphalt pavements. Placed within the upper bound layers of the pavement Road Mesh® reinforces the asphalt layers, extending fatigue life, minimising disruption through pot-holes and resurfacing works. Road Mesh® provides lateral restraint to the asphalt, which improves resistance to rutting and shoving. It absorbs and ultimately reduces the peak tensile stresses caused by the presence of reflected cracks and/or traffic. Road Mesh® is engineered from our 8×10 double twisted hexagonal woven steel wire mesh, with integral transverse reinforcement bars woven into the mesh at approx. 16 cm intervals. Road Mesh® is unrolled into position and secured appropriately before the upper asphalt layers are placed. Road Mesh® not only reduces reflective cracking and rutting, but structurally improves the pavement construction, reducing fatigue. It can also be used in new-build roads, and not just overlays. 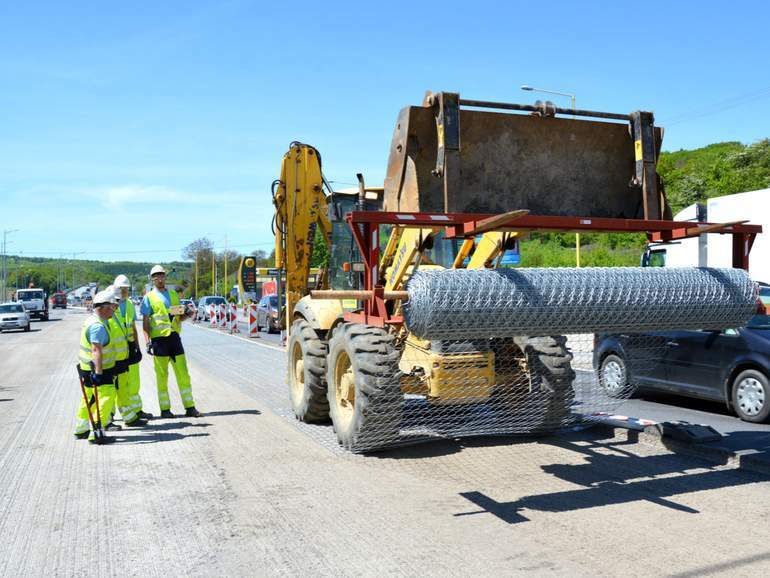 Based on the results of both laboratory and large-scale tests carried out in the UK, USA, Italy and Slovakia over the past 15 years, it can be proved that Road Mesh® steel wire mesh reinforcement produces a threefold increase in the service life of highway pavements compared to unreinforced ones, resulting in reduced operational and maintenance costs. Road Mesh® has been used in several sites in the Czech Republic, Slovakia, Poland and other countries (USA, Italy, UK, etc.). One of our latest installations is on the D1 Budimir-Bidovce motorway, in Slovakia. The designer found that our product was the most suitable solution to increase pavement service life and road safety. The grid was used to connect an existing carriageway to a new one, so that eventual longitudinal reflective cracks resulting from the differential settlement between the old and the new pavement can be limited. MACCAFERRI CENTRAL EUROPE provided a complete technical service, supporting the client both in the design phase and during installation.